Oldest American World War II Veteran Dies At 112 Richard Overton enlisted in an all-black battalion, serving in Iwo Jima and Okinawa. He loved ice cream, whiskey and cigars. "Today we mourn not just a hero, but a legend," the U.S. Army said. 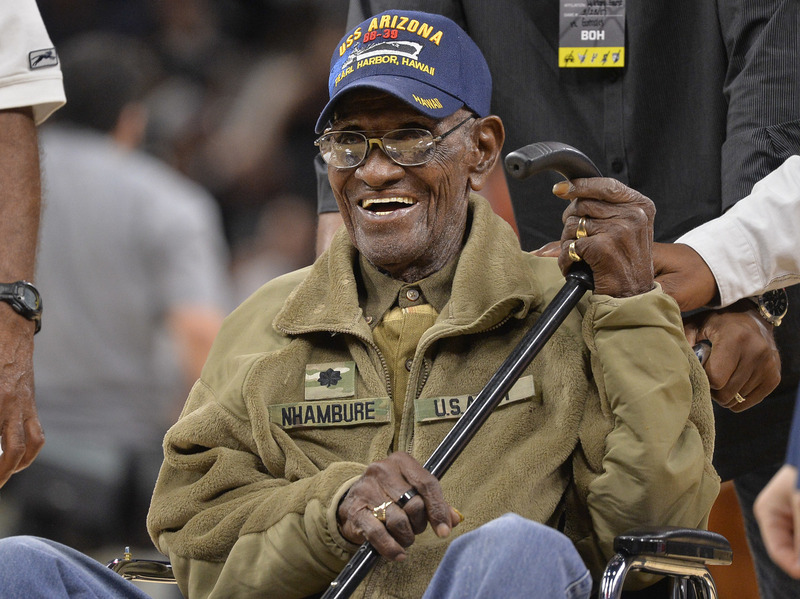 Richard Overton had been the oldest living veteran of American wars. He died Thursday. The United States has lost its oldest World War II veteran. Richard Overton, who fought overseas in a segregated unit, died Thursday at age 112. He was hospitalized recently after a bout with pneumonia and took his last antibiotic on Dec. 21 — "a true soldier in fighting this infection battle with all that he has," his cousin, Volma Overton, said on Facebook. Richard Overton was born in 1906, near Austin, Texas. He enlisted in the Army in 1940, before the Japanese attack on Pearl Harbor. He joined the 1887th Aviation Engineer Battalion, a unit made up of black soldiers, and served in Pearl Harbor, Okinawa and Iwo Jima. "It was difficult," he told NPR's Morning Edition in 2015. "I'd never done that before. Uncle Sam called me in. And I went there, and I had to do it." In an interview with the Austin American-Statesman, he described clearing bodies from battlefields and landing under fire more times than he could remember. "We got in the foxholes, and bullets were coming over our heads," he said. Overton told NPR he was glad to go home unscathed. "I'm glad I didn't get like some of the others," he said. "Some got their arms off. Some got their leg off. Some lost their body. Some lost their soul." After the war ended, he lived in a house he built in Austin. From his porch, he was known to chat with neighbors. A sign on his door read, "Making friends since 1906," the Statesman reported. As the decades passed, he was lauded for his service. In 2013, President Barack Obama invited him to Washington, D.C., for Veterans Day; he received a standing ovation at the Memorial Amphitheater at Arlington National Cemetery. "Everybody, I want you to know a little something about Mr. Overton here," Obama said. "He was there at Pearl Harbor when the battleships were still smoldering. He was there at Okinawa. He was there at Iwo Jima, where he said, 'I only got out of there by the grace of God.' "
The president pointed out that Overton returned to a United States marred by racial inequality and that "his service on the battlefield was not always matched by the respect that he deserved at home." Black veterans were often denied jobs or housing. Obama said Overton carried on with dignity, working in furniture shops and at the state capital as a courier. "And every Sunday, he hops in his 1971 Ford truck and drives one of the nice ladies in his neighborhood to church," Obama said. In 2014, Overton was honored by the U.S. Coast Guard Mid-Atlantic. "He fought and risked his life in service to his country despite the fact that he was not yet treated as an equal back home," said Capt. James O'Keefe. Overton faced different challenges as he got older. His family needed help paying for his home health care and raised money through a GoFundMe page. Last summer, family members said, Overton's money and identity were stolen after someone accessed his Social Security number and bank account. His bank restored the pilfered funds, according to The Dallas Morning News. On Overton's 111th birthday, part of his street was renamed for him, KUT reported. He was also honored during a basketball game between the San Antonio Spurs and the Memphis Grizzlies. He chalked his long life up to aspirin, stress-free living and yardwork. He was also known to eat ice cream, drink whiskey and smoke cigars. Mourners stopped by his Austin home on Thursday night with flowers and candles, according to local media. The U.S. Army offered prayers to the Overton family, saying on Twitter, "Today we mourn not just a hero, but a legend." Texas Gov. Greg Abbott called him an icon who "made us proud to be Texans and proud to be Americans."